Concrete lasts for decades when properly installed by a professional contractor. Concrete pavement doesn’t need resurfacing, periodic patching or frequent sealing like asphalt. 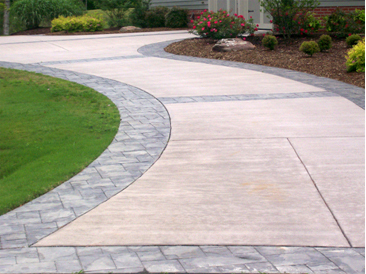 Concrete is less expensive over time because it lasts longer and requires less maintenance. Concrete also increases the resale value of your property. Concrete doesn’t bleed messy, sticky tar to get tracked inside on carpet and tile. Concrete will not develop potholes or ruts that can be tripped over. Concrete has excellent light reflectance for greater nighttime security. Concrete gives your property a look of quality and sophistication. Concrete doesn’t contain oil and requires less energy to produce than asphalt. Concrete can have the look and feel of brick, tile, slate, stone or even wood. Add color and you have a look that complements a variety of finishes and textures.